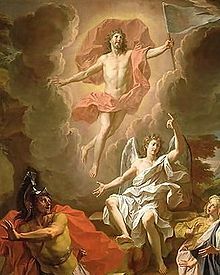 The resurrection of Jesus Christ from the dead, described in the New Testament as having occurred three days after his crucifixion at Calvary. Easter is the central feast in the Christian liturgical year. According to the Canonical gospels, Jesus rose from the dead on the third day after his crucifixion. His resurrection is celebrated on Easter Day or Easter Sunday (also Resurrection Day or Resurrection Sunday). The chronology of his death and resurrection is variously interpreted to have occurred between AD 26 and 36. Easter marks the end of Lent, a forty-day period of fasting, prayer, and penance. The last week of the Lent is called Holy Week, and it contains Good Friday, commemorating the crucifixion and death of Jesus. Easter is followed by a fifty-day period called Eastertide or the Easter Season, ending with Pentecost Sunday. Bishop TD Jakes:Here is the amazing thing about Easter; the Resurrection Sunday for Christians is this, that Christ in the dying moments on the cross gives us the greatest illustration of forgiveness possible. Joseph Addison, in Moral and Religious Quotations from the Poets: Topically Arranged … (1861), p. 167. Lizzie Akers, in Easter Bells (Akers). Lizzie Akers, in "Easter Bells (Akers)". W. H. Auden, in Melodies Unheard: Essays on the Mysteries of Poetry 01 August 2005), p. 135. Pope Benedict XVI, in Milestones: Memoirs, 1927-1977 (1998), p. 6. I am the first and the last. I am he that liveth, and was dead; and, behold, I am alive for evermore, Amen; and have the keys of hell and of death. Bible, in Select Notes on the International Sabbath School Lessons, Volume 5 (1878), p. 230. Remember Jesus of Nazareth, staggering on broken feet out of the tomb toward the Resurrection, bearing on his body the proud insignia of the defeat which is victory, the magnificent defeat of the human soul at the hands of God. Frederick Buechner (1968), The Magnificent Defeat, p. 18. Easter had come; the season of light and refreshment for universal nature! Winter, as he departed, had shrouded himself in a veil of gloomy mist, and spring followed close after fleeing abysmal clouds. She had sent forth the blasts, her messengers, to arouse the earth from its slumber; they roared above meadow and plain, waved their wings around the mighty summits of the mountain ranges, and stirred the sea to its depths. There was a savage conflict and turmoil in the air, whence issued, nevertheless, a note as of victory. The blasts were those of spring, and were instinct with life,—they heralded a resurrection. Elisabeth Bürstenbinder, Saint Michael, trans. A.L. Wister, Philadelphia: J.B. Lippincott, 1901. Peter Cottontail, in Peter Cottontail: Easter Musical in One Act (1951), p. 25. Charles M Crowe, 1001 Ideas That Changed the Way We Think (29 October 2013), p. 246. Saint John of Damascenus, in The Congregational Hymn Book: Psalms and Hymns for Divine Worship (1881), p. 219. Robert Flatt, in What is God Waiting For? : Understanding Divine Delays in Your Life (7 August 2006), p. 176. Benjamin Franklin (2011), in The Way to Wealth: Advice, Hints, and Tips on Business, Money, and Finance, p. 14. During Easter we are reminded that we have died with Christ and rise again to new life with him through our kingdom. We are sprinkled with the waters of baptism in order to remember and call forward our own baptism. We are reminded that through baptism we participate in Jesus’s paschal mystery. Gospel, in Word and Worship Workbook for Year C: For Ministry in Initiation, Preaching ...(1 January 1997), quoted by Mary Birmingham p. 274.
and renew your gift of life within us. We ask this through our Lord Jesus. Harts, in Easter Angels', in Church pastorals: hymns and tunes for public and social worship (1864), p. 72. Basil Hume, in Easter 2014: Best Quotes and Poems to Commemorate the Resurrection of Jesus (18 April 2014). New Saint Joseph, in People’s Prayer Book, in Parent Newsletter (March 2013). Charles Kingsley (1882), in Poems: Including The Saint's Tragedy, Andromeda, Songs, Ballads, Etc, p. 289. Easter is the principal feast of the ecclesiastical year....the greatest feast (festum festorum), and that Christmas is celebrated only in preparation for Easter. Leo I (Sermo xlvii in Exodum), quoted in Easter. Michael Leunig, in Quotation Saturday: Easter (19 April 2014). Our Lord has written the promise of the resurrection not in books alone but in every leaf in spring time. Martin Luther (1869), in Watchwords for the Warfare of Life, p. 317. In the cross of Christ God is taking man dead-seriously so that he may open up for him the happy freedom of Easter. God takes upon himself the pain of negation and the God forsakenness of judgement to reconcile himself with his enemies and to give the godless fellowship with himself. Jürgen Moltmann (1972), in Theology of play, p. 33. Marvin Olasky, in Forbes, Volume 180, Issues 8-13 (2007). John Paul II, in Force of Nature (3 December 2013), p. 215. During the first 13 centuries after the birth of Jesus in Bethlehem, no one thought of setting up a creche to celebrate Christmas. The per-eminent Christian holiday was Easter, not Christmas. Nancy Pearcey, in Obama's "Christian Label" and the War against Nativity Scenes (24 December 2010). Byron Pulsifer, in At Foxborough we follow the Three Diamond Rules (3 April 2014). So hushed the brooding air, I could hear the sweep of an angel's wings;br>If one should earthward fare. Edna Dean Proctor,in Joe Mitchell Chapple's National Magazine, Volume 40 (1914), p. 27. Walter Raleigh, in The Figure of the Singer (4 July 2013), p. 75. Easter celebrations participate in spring's theme of fertility and rebirth. In the |midnight mass, the Pope wears a white robe and lights a large white candle of the ”new-fire” to symbolize the hope and new light of the resurrected Christ. Santino, in Land, Seasons, Weather, Insect: The Dairy Farmer's Guide to the ..., Volume 4 (1 March 2013, p. 53. Edward Thomas, in The Imagination of Edward Thomas (1986), p. 193. N. T. Wright, in Surprised by Hope (5 May 2009), p. 20. Easter is the central celebration of the Christian liturgical year. It is the oldest and most important christian feast, celebrating the Resurrection of Jesus Christ. The date of Easter determines the dates of all movable feast except those of the Advent. Easter occurs on the Sunday after the first formal new moon on or after the official spring equinox on March 21; it can occur between the Gregorian calendar dates of March 22 and April 25, inclusive , for Western churches and between the Gregorian calendar dates of April 4 and May 8, inclusive, for Eastern churches that use the Julian calendar for the dating of Easter. John Chrysostom, in Christ at the Center: The Early Christian Era 2009, p. 151. Easter was first mentioned in a mid-second century Paschal homily believed to be written by Melito of Sandis (d.c.180) for reading aloud in the morning of Pascha, an earlier name for the feast. 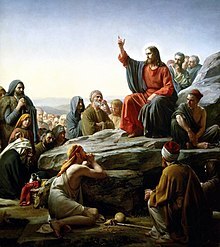 Originally, Easter was observed with Jweish Passover, but after the first council of Nicaea in 325 it was declared that Easter should be observed on Sunday, held to be the day of resurrection of Christ. The date was movable being the first Sunday after the first full moon after the spring equinox. Melito of Sardus, in "1001 Ideas That Changed the Way We Think (29 October 2013)", p. 246. Melito of Sardus:...the egg symbolizes new life breaking through the seeming death of eggshell, represented by the hardness. This symbolic representation of the egg likely predated Christianity, but was adapted to represent Christ’s return from death and coming forth from the tomb. Easter basket of candy eggs. Two of the most common symbols of Easter are the egg and the rabbit; and the egg symbolizes new life breaking through the seeming death of eggshell, represented by the hardness. This symbolic representation of the egg likely predated Christianity, but was adapted to represent Christ’s return from death and coming forth from the tomb. Real-Encyklopædie, s.v. Ei), quoted in "Easter." Both coloured and uncoloured eggs are used in some parts of the United States for this game, known as "egg-picking". Another practice is the "egg-rolling" by children on Easter Monday on the lawn of the White House in Washington. Hedwig didn't return until the end of the Easter holidays. Percy's letter was enclosed in a package of Easter eggs that Mrs. Weasley had sent. Both Harry's and Ron's were the size of dragon eggs, and full of home-made toffee. Hermione's, however, was smaller than a chicken's egg. Her face fell when she saw it. "Your mum doesn't read Witch's Weekly, by any chance, does she, Ron?" she asked quietly. "Yeah," said Ron, whose mouth was full of toffee. "Gets it for the recipes." Hermione looked sadly at her tiny egg. J.K. Rowling, in Wednesday Words - Easter, quoted from Harry Potter and the Goblet of Fire. The Easter rabbit is also likely to hark back to cultures to cultures predating Christianity, for which the appearance of the rabbit in the landscape symbolized the coming of spring (itself symbolized by the animal’s renowned fertility). The rabbit has been adopted by many Christian cultures, but has not taken any specific Christian meaning comparable to that of the egg. The Easter Rabbit lays the eggs, for which reason they are hidden in a nest or in the garden. The rabbit is a pagan symbol and has always been an emblem of fertility. Simrock, Mythologie, 551, quoted in "Easter." Quotes reported in Hoyt's New Cyclopedia Of Practical Quotations (1922), p. 209-10. Thomas Blackburn, An Easter Hymn. Phillips Brooks, An Easter Carol. Like the strong sunrise, broke away? Frederick William Faber, Jesus Risen. And high o'er heaven was throned. Fortunatus (Bishop of Poictiers), Hail, Day of Days! in Peals of Praise. Yes, the Lord has risen to-day. Thomas Kelly, Come, Ye Saints, Look Here and Wonder. And in all hearts new-born! And hear My Son in heaven! James Russell Lowell, Godminster Chimes, Stanza 7. Martin Luther, In the Bonds of Death He Lay. Bright with victory o'er his foes. Hallelujah! Hallelujah! From the Latin of the 12th Century. J. M. Neale. Trans. Edna Dean Procter, Easter Bells. Edna Dean Procter, Easter Morning. For Christ is risen and all the earth's at play. Christina G. Rossetti, Easter Carol. Robert South, Sermons, Volume II. Ser. 8. All welcome, even the least! A. R. Thompson, We Keep the Festival, From the Roman Breviary. Charles Wesley, "Christ the Lord is Risen To-day". Jesus Christ is Risen To-day. From a Latin Hymn of the 15th Century. Translator unknown. This page was last edited on 28 March 2018, at 17:34.